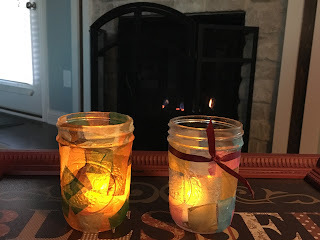 My 7-year old made these fun fall lanterns. It was a very quick project, since we used Mod Podge. It dries quickly (but it’s a little stinky until it dries). She gave one to her teacher as a Happy Fall gift. We put a small battery-powered tea light inside. See the next post for materials needed and instructions. This is a cute idea! Love it.